The Bainbridg﻿e Island Middle School Robotics Club is in its third year. We are split into two teams in the FIRST Tech Challenge robotics competition, where all the teams build a robot to play a game against each other. The goal of our robotics club is to get middle school kids excited about Science, Technology, Engineering and Mathematics. Follow us on Instagram, ﻿Twitter, and Facebook, and subscribe to our YouTube! 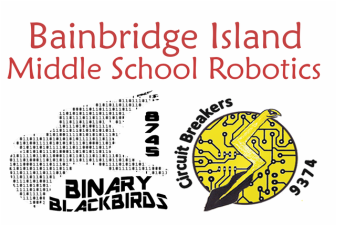 See our YouTube channel at Bainbridge Island Middle School Robotics!